Connell Crooms, Jacksonville mayoral candidate. Update: Connell Crooms switched his campaign plans after this story's publication. He is running for a At Large Group 1 City Council seat. Mayoral, constitutional and city council candidates have many hoops to jump through in order to qualify for candidacy and a big deadline is fast approaching. In order to qualify, those candidates are required to either pay a qualifying fee or submit signed petitions. Completed and signed petitions are due at the Duval County Supervisor of Elections office before noon on Monday, December 10. 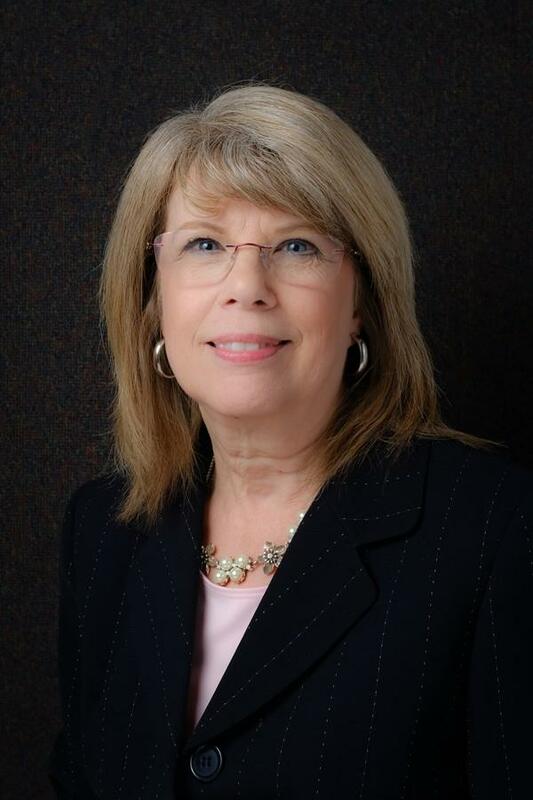 Lana Self, Candidate Services Director for Duval County. Duval County had 607,400 registered voters at the time of the 2018 midterm election in November. That means mayoral and constitutional candidates (sheriff, property appraiser, tax collector, at-large city council members and supervisor of elections) need to get 6,074 signatures in order to qualify. Self said candidates can start collecting those signatures as soon as they file the required paperwork, appoint a campaign treasurer and designate a depository with the elections office. Instead of collecting petition signatures, candidates can also opt to file a qualifying fee. The amount of that fee is based on the authorized salary for the position as of July 1 of the preceding year. Salaries are determined by the state and are based on population. Qualifying fees and petition requirements for 2019. Qualifying fees for candidates associated with a political party are 6 percent of the annual salary of the office that candidate is seeking. 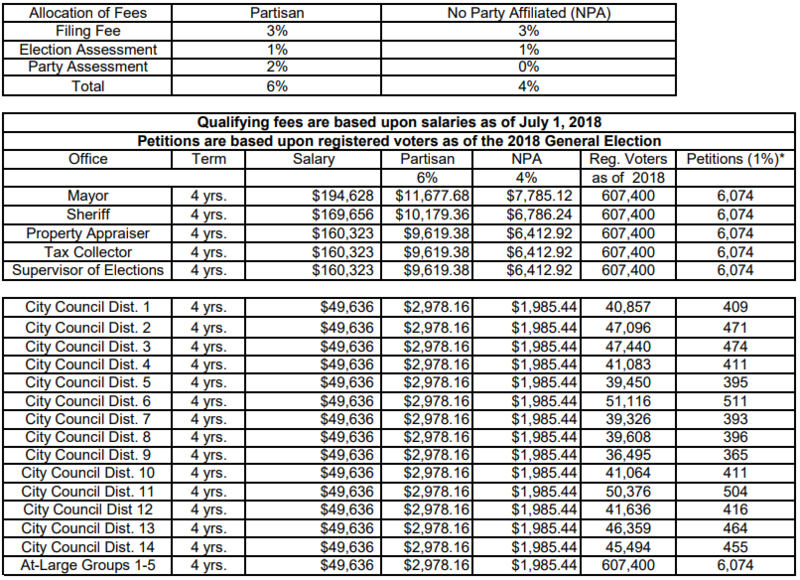 The fee is 4 percent of the salary for candidates with no party affiliation (NPA). The extra 2 percent partisan candidates pay goes to the state party they are associated with. Qualifying fees are drawn from the candidates campaign account. Crooms said it’s been challenging, but he’s already raised more than $6,000. As a NPA candidate, he’s required to pay a qualifying fee of $7,785.12 in order to run for mayor. Crooms is an activist who became known to Jacksonville residents after he and others protesting U.S. airstrikes in Syria were arrested in Hemming Park last year. Crooms was hospitalized after the incident and accused the Jacksonville Sheriff’s Office of police brutality. Crooms said the Duval County Elections Office has been very accommodating, but there have been a lot of unnecessary challenges mandated by the state in the filing process. “They systematically set things up to where if you don’t have the community support in a mass way behind you then getting on the ballot is going to be a struggle already,” Crooms said. The qualifying period for unitary elections runs from January 7 to January 11. That’s when candidates who have filed paperwork with the elections office, opened a campaign account and collected petitions or are raising money are required to submit additional paperwork and forms. “That paperwork includes a candidate oath, a financial disclosure form and their check for the qualifying fee if they did not submit the required number of petitions,” said Self. The first election will be held on March 19, 2019. Candidates who get a majority of the votes cast in their contest during that election will be declared the winner. Other races will proceed to the general election on May 14, where the two candidates who had the highest vote totals in the first election will face each other again. A partially-deaf protester arrested at Hemming Park a couple of months ago said he’s planning to sue the Jacksonville Sheriff’s Office. Connell Crooms was protesting U.S. airstrikes in Syria when he was detained and injured during the arrest. Charges against him have since been dropped. Left-leaning activists rallied Sunday evening in Jacksonville’s Memorial Park and held a candlelight vigil mourning the one dead and several injured at the “Unite the Right” rally in Virginia Saturday. Thursday on First Coast Connect we spoke with Jacksonville Mayoral candidate Connell Crooms. He is best known as one of the members of the Hemming Park 5, who were arrested and beaten by police at a protest last year in the park over the Trump administration’s bombing of Syria (01:16).